Sure, there's technically a "reason" why you're hunting down the massive monsters at the heart of the game. In humanity's never-ending quest to conquer the universe and grind nature under its heel, it's landed on the planet Shear. Only on Shear, nature fights back. The "monsters" are just protecting their habitat, destroying valuable human colonies in the process. Think Fern Gully on steroids. Despite this reasonable, lore-supported explanation, it's impossible to get an image of the stereotypical big-game hunter out of my head—safari outfit, permanent sneer, big ol' elephant gun. Basically, the bad guy in Jumanji. Heck, one of the characters is even modeled directly off that archetype. Well, sorry Space-PETA. It turns out big game hunting is pretty thrilling. At least at first. 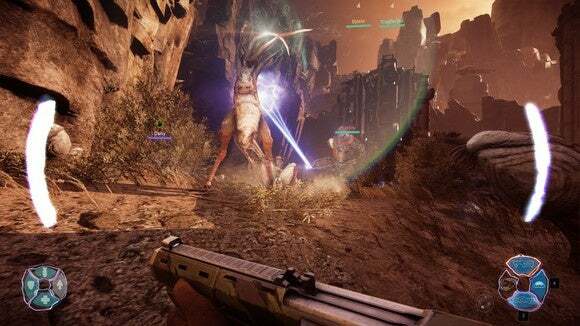 Evolve is the first game developer Turtle Rock has made since Left 4 Dead, which in game terms is basically an eternity ago. And on the surface, it feels a lot like its predecessor. One (much-discussed) aspect of Evolve is a team of four "Hunters," tasked with taking out the aforementioned monster. The catch—the thing that differentiates it from a reskinned Left 4 Dead—is that the monster in question is actually another player. 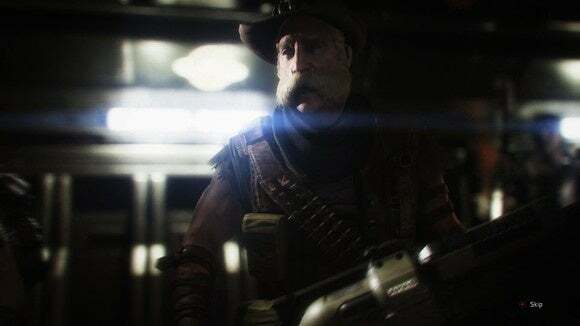 Where Left 4 Dead relied on the AI "Director" for a constantly-shifting challenge, Evolve pits humans against other devious humans. 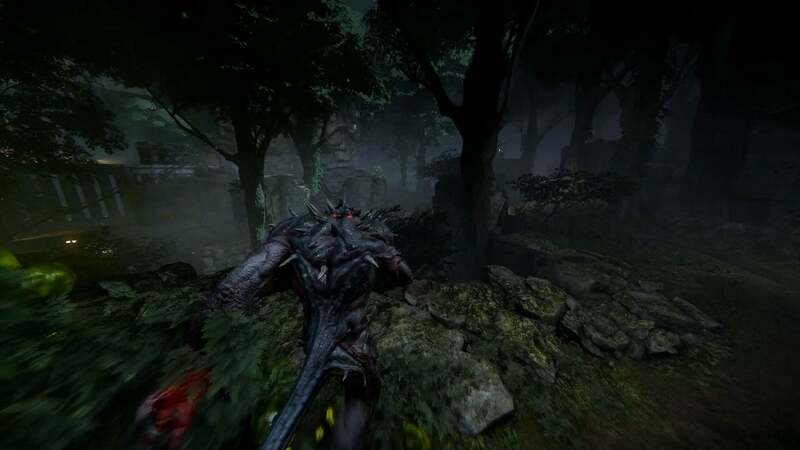 The core of Evolve is "Hunt" mode. The monster is let loose on a map and given a bit of time to run away. After that, the hunters land in the match and begin pursuit. Either the hunters kill the monster or the monster kills the hunters. Matches start slanted towards the hunters—the monster is relatively weak to start. 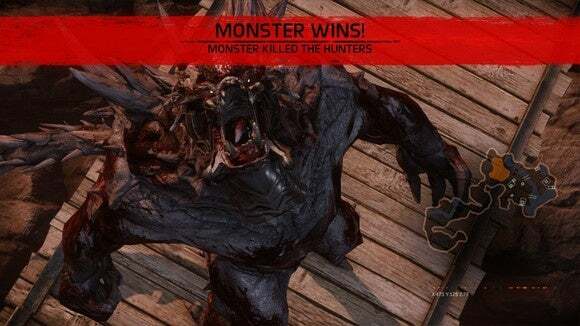 By killing and eating wildlife however the monster can "evolve" into its stronger forms, adding new abilities and more health. In its second tier the monster is an equal match for the humans. In its third tier the monster has the advantage. It behooves the hunters to catch up to the monster as quickly as possible, which is where the games various classes come into play. 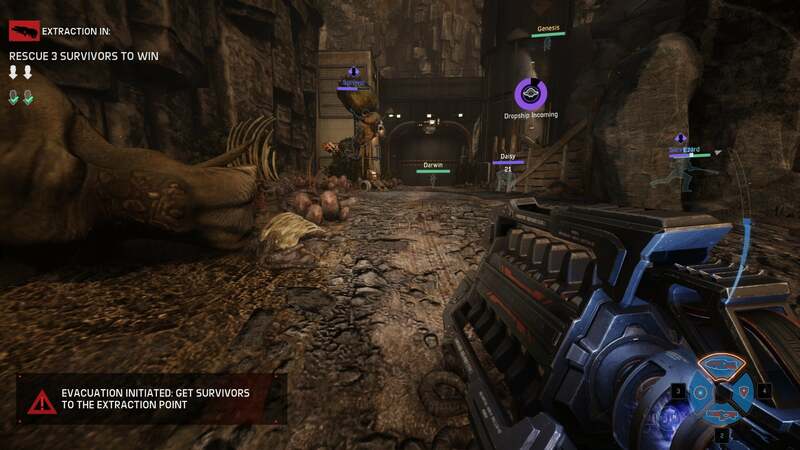 There are four roles in Evolve: Assault (basic damage-dealing), Trapper (tracking down the monster), Medic (healing the others), and Support (variety of helpful abilities). Only one of each class can be in a game, and classes are further subdivided into three hunter choices per class. 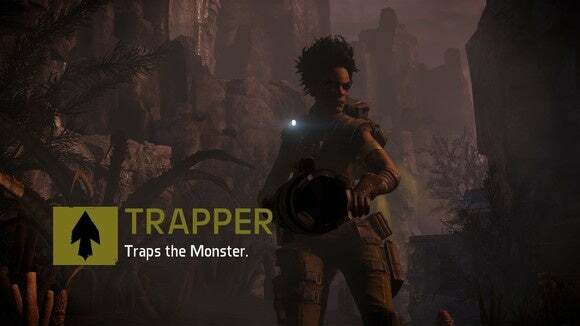 For instance, the Trapper class specializes in tracking down the monster and then keeping it in one place with the Mobile Arena ability—think "Thunderdome." The initial Trapper you play as is Maggie, who has a dog Daisy that tracks the monster on its own. Griffin, unlocked later, tosses "Sound Spikes" that activate any time the monster makes noise nearby and notifies the hunters of its whereabouts. The third Trapper you can unlock, Abe, has tracking darts. Three different approaches to what's basically the same concept. One of the main issues with Evolve is it takes forever to unlock new characters. You're put through a series of hoops (deal X damage with Y weapon, use Z ability V times) with each bottom-tier character before you unlock the next, and it takes altogether too long to do so. This is aggravated by the fact that you're unlocking class-by-class, but the game won't necessarily stick you in that role each time. You basically say "I prefer to play this class" and hope the game slots you in, but if it doesn't you're stuck chipping away at a different class's unlocks instead. It took me three hours just to unlock my first new character. That's out of eight unlockable characters total, plus two monsters to unlock. That's...a long time. It's also not very useful because it coerces you to play each class in Evolve a certain way. There were plenty of skills I found pretty useless in certain contexts—try being a Trapper in a non-Hunt match and the game telling you to "follow Daisy" even though it doesn't make sense—but found myself using just to rank up, which is frustrating. There are going to be players who never unlock all twelve characters. I'll probably be one of them. So we come to the crux of the issue. I'm worried Evolve is going to be this year's Titanfall. They're both multiplayer-focused shooters that have brought something new and interesting to the scene—in Titanfall's case a renewed focus on mobility and the dual mech/soldier mechanics, in Evolve the four-on-one asymmetric monster-hunting. They're both games that I was extremely excited about the first time I played. And they're both games I got more and more bored with as time went on. Now, that's true of all games of course. Even if you're one of those people that puts thousands of hours into League or Civilization or whatever, you've probably come across games you get bored with. 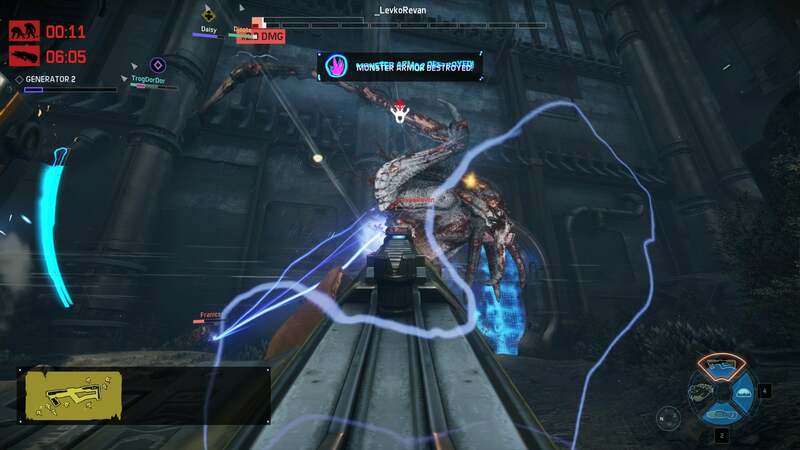 The problem with Evolve (and Titanfall) is the speed with which I got bored. The first few matches of Evolve everything seems fresh—almost overwhelming, to be honest. There are a dozen mechanics to get a handle on, and it's easy to feel lost. I've had fellow players literally apologize in the chat with, "Sorry, first time playing this character. Please don't hate me. Don't know what I'm doing." But the game feels like a grind long before it should. The maps are gorgeous, but don't have a ton of character. No matter the setting (jungle, desert, more jungle), you're still basically running in circles—either as the monster trying to escape pursuit or as the hunters trying to track down your prey. Occasionally you get a match that comes down to the wire, but most of the matches I've played went one of two ways: The monster screws up early and is mercilessly murdered by the hunters, or the monster leads the hunters on a fruitless chase for eight minutes until it's evolved to maximum level and then returns to wreak havoc. Evacuation mode, which tasks you with playing five rounds in a row, is better. Here, matches get small twists in the form of persistent map effects—if the hunters fail to save a power plant, for instance, there are radioactive patches in the next round that can hurt them. Also, you get some objective-based gametypes which help break up the repetitiveness of all-Hunt-all-the-time. But even Evacuation can get a bit boring once you've seen what it has to offer or if you get stuck in a lopsided match where one side rolls the other. It's also spectacularly long—five rounds typically takes between 30-40 minutes, so it's not suited to quick drop-in play. As a game built specifically for online and multiplayer, it's a bit hard to speculate on Evolve's future. Sure, this isn't an MMO but some of the trappings are there. Turtle Rock has already patched some of the more glaring issues found in the beta, and I'm sure that process of balancing will only ramp up now that the game is out. And I expect high-level play to improve as people start learning the game and playing with a team of four tightly-coordinated friends instead of with a random group of jagoffs. I'm just not convinced of the game's broader staying power though, and that's a shame. I mean, Destiny is by all accounts not a great game and yet it's managed to (somehow) cling to life. Evolve on the other hand is pretty fun, and I'm sitting here concerned whether we'll be discussing it in six months. That's crazy! All new maps will be free, but you'll pay for new hunters and monsters. There are some pros to this scheme—making maps free means you don't fracture the player base in any way. Great! Admirable. On the other hand, the hunters and monsters are core to the game, and undoubtedly much more interesting to players conceptually than new maps. The problem? You'll pay $7.50 for a new hunter and $15 for a new monster. That's a lot of money. And it leaves Turtle Rock in a weird situation—namely, how to convince players to spend that much without totally breaking the balance or usefulness of the characters that already exist. It's a mess, and what's even more of a shame is that this DLC plan has become so inextricably tied to the game's reputation. You almost can't discuss Evolve without discussing its DLC in the same breath, which puts the core game at a disadvantage. Evolve creates a spectacular first impression that grows dimmer over time. Once the novelty of its asymmetrical multiplayer wears off, you're left noticing all the areas where its ambitions aren't quite met by reality. Does that make it a bad game? Definitely not. There are a lot of fascinating concepts in Evolve—I'd especially like to see something like Extraction Mode's persistent multiplayer effects make it over into other games—and I've gotten more hours of entertainment from Evolve than quite a few other games. But who knows what Evolve will look like in six months or a year? We're faced once again with an increasingly common conundrum—how to judge a game that's (pardon the pun) expected to constantly evolve over its lifespan. Ultimately I've tried to base my reviews at PCWorld off two fairly simple maxims: "Does the game accomplish what it sets out to accomplish?" and "Is it any good?" In this case, yes, I think Evolve is good. Great even, while it lasts. I also think Turtle Rock set out to create a game with a lot of staying power, and I'm not so sure they've accomplished that bit. Time will tell. Note: No review score on this, for the same reason as most multiplayer-focused games these days—we want to make sure the servers hold up, that the whole game doesn't melt into a catastrophe shortly after launch, et cetera. We'll see how this all plays out and update this review-in-progress when it seems appropriate.